Home > Paul's Blog, Video Games > Watching Captain Marvel, I couldn’t help but get a Metroid vibe…especially in terms of the music! I watched Captain Marvel on its Thursday night debut and first of all, really enjoyed it. Fun movie from beginning to end, with most of it being great and quite a few parts being spectacular. If you want good action, quite few laughs, and some beautiful special effects, I think it’s well worth your time. 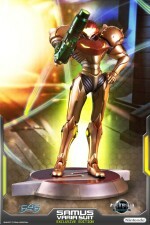 Now then, I couldn’t help but get a very Metroid-inspired vibe in the beginning of the movie…almost to that of Other M. Some may see the similarities, others not, but what I think is pretty non-arguable is the main music that accompanies Brie Larson’s character and how close it is to Super Metroid. Here’s to Captain Marvel doing great in the box office and is getting a live action Metroid flick in the near future! Previous post: Check out the official second trailer for Shazam! Next post: Watch the official trailer for Disney’s Aladdin!